I love books that prove me wrong about my feelings towards a character like this book did. Author Tracy Tappan does a phenomenal job of taking for me an unlikeable character and making him lovable in slow precise realistic detail. Military terminology used in this book is supported with definitions creating a deeper understanding of the plot. I found it an enjoyable read because I also learned Military terms I never knew about and I love learning new things. My first introduction to Lieutenant Kyle “Mikey” Hammond was in Beyond The Call Of Duty. I instantly disliked his personality and how he dealt with stress. Even so I wanted his story. I knew he was deeper than he let on. The author develops his character throughout the book offering the readers insight into why he acts as he does regarding women. At the end the reader will fall in love with him. Samantha straight off the bat was a character that I loved. She was calm and feisty with the innate ability to see through Kyle and hold him accountable for his actions. Her character continually surprised me with how she reacted to him. A strong woman who was able to overcome her fears and move actively towards getting what and who she wanted she was a character that I would want to be like. I truly loved this book and give it 4.5 stars. 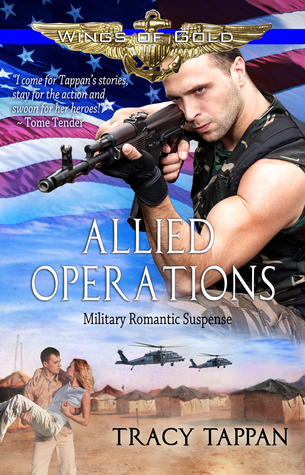 Tracy Tappan is running a Book Launch Contest for ALLIED OPERATIONS (from April 4th thru April 11th, International welcome), offering the chance to win a Kindle Fire HD8 worth $149 (you can find the exact specs HERE). Tracy is the bestselling and award-winning author of gritty romance, her books spanning genres across paranormal (The Community series), military romantic suspense (The Wings of Gold series), and medieval historical (The Baron’s War trilogy). During nearly twenty-five years spent as a naval aviator’s wife, she lived all over the United States and in Europe, enjoying seven years overseas in the diplomatic community, first in Rome then in Madrid, until she settled back in San Diego. Tracy holds a master’s degree in Marriage, Family, and Child Counseling (MFCC), loves to play tennis, is a volunteer puppy raiser for Guide Dogs for the Blind, and enjoys a good glass of wine.